Here’s the deal. Less than 1% of startups get funded. Yes, less than 0.05% of startups get at least one round of VC investment while 0.91% are angel funded, according to research findings by Fundable. Here’s another fact. Over 80% of startups are self-funded through personal savings, credits, family and friends, according to the Center for Venture Research and the Small Business Administration. That’s all good to know, so what? I don’t have personal funds, I’m already in debt, and I don’t want to ask for money from family or friends. Is taking a shot at the 1% investor funding my only option? Would you take a shot at investing in someone (likely a stranger) with just an idea, no traction or revenue? Even if your answer is Yes, good luck finding someone like you. Here’s the good news. You don’t need to rely on anybody. I mean it. You don’t NEED or HAVE to rely on anybody for a while. At least until you build enough value that scaling becomes imminent. Another good news. It has never been cheaper to build a startup. 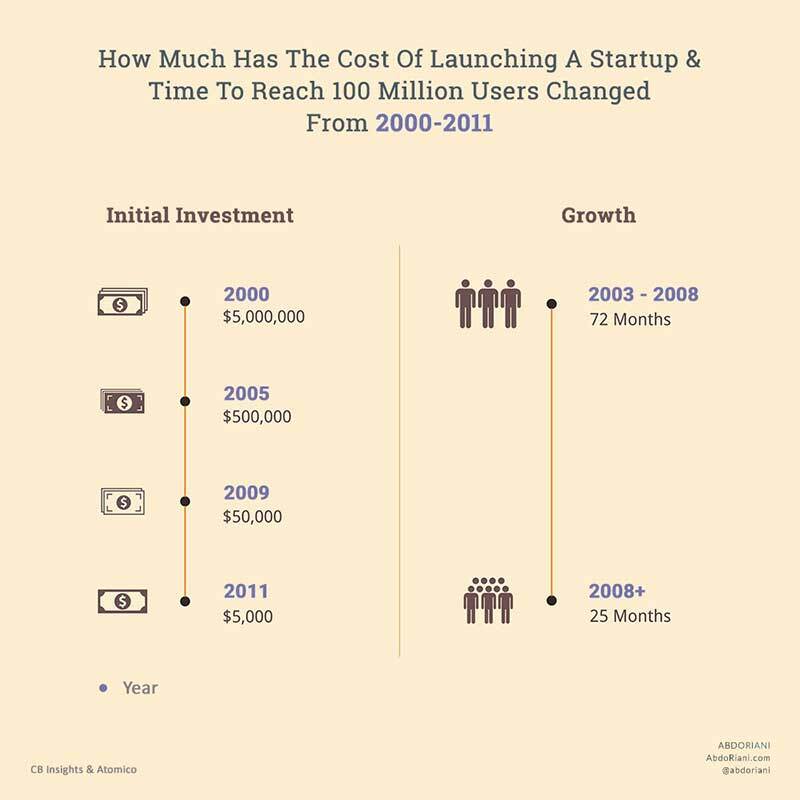 According to CB Insights, it used to cost $5 million to launch a startup in 2000. It costs less than $5,000 today thanks to open source software and cloud-based tools. The time to reach 100 million users has also decreased tremendously from 72 months in 2003 to a little over 2 years today, according to Atomico. What self-funding, also known as bootstrapping, is really about. How to self-fund your startup by NOT touching your savings, getting in debt, or asking money from friends and family. How to self-fund your startup using non-scalable resources. Bootstrapping is about maximizing human capital first and using existing and/or self-generated funds second, to take an idea or company from one point to the other without referring to investors or banks. First things first, Maximizing Human Capital. Getting the most out of our bare hands is what maximizing human capital means. And this is where the fit between the opportunity and skill set comes into play. When your skills as a founder are directly aligned with the market and business opportunities, you are less likely to need outside help, at least for some time until some milestones are met. Bootstrapping is about hustle. The question is, hustle for what? going above and beyond to understand customer needs is hustle, selling from door to door is hustle, working overtime to save for product development is also hustle. The ability to build the product, the know-how of selling it and the skills to grow it remove a lot of friction out of starting, running and hustling through the startup journey. No one knows it all but the point is that the first rule of bootstrapping is to pursue a startup venture where your skills, background and the opportunity are aligned. Maximizing human capital also means surrounding yourself with the right people. The capital is stronger and better diversified when two or more people with complementary skills are sharing the vision and responsibilities. The combination can mean focusing on what you are good at, make better decisions and most importantly increasing chances of success: founding teams of 2 raises 30% more money, have almost 3 times user growth, and are 19% less likely to scale prematurely, according to the Kauffman Foundation. The benefit of the group is common knowledge. The last two paragraphs discussed interesting insights but things are not this beautiful in real life. Finding the best opportunity where our set of skills can directly impact our progress is rarely what happens, furthermore, finding a co-founder is one of the most challenging parts of building startups. Running a startup with limited human capital, no funds and co-founders can thus seem like an impossible mission. This guide assumes you have no prior startup knowledge or co-founder, to show you how to bootstrap (self-fund) a startup from nothing to something while making money doing it. And if you do have a strong technical or non-technical background and currently reading this guide with a co-founder, you will learn how to get the most out of your knowledge and collaboration to generate revenue and make significant progress with your startup. Let me first begin with what may be a good news for non-technical founders. Contrary to common belief, it has been shown that teams with non-technical founders outperform others with at least one technical co-founder by 31% for consumer products. In other words, if you are not building enterprise solutions, your odds of success without a technical co-founder are still high. Higher, in fact. Technical co-founders are essential to the success of enterprise startups, the venture capital firm First Round Capital shows. In fact, enterprise startups with technical founders outperform their non-technical colleagues by 230%. Now with this, does it all mean non-technical founders building consumer products don’t need tech at all? the answer is obviously No. Someone is going to have to code a software or build a hardware. We’re thus back to where the hiring, development and marketing funds are going to come from. Let us turn our attention to self-generated funds and discuss why you wouldn’t even need your savings. I took my startup from idea to profitability in a year and a half. Because of my limited resources, it took me a little over 8 months to build the initial version of my paid product. 2 weeks to gather all the insights I needed from my potential buyers and 8 months to build a simple version of my product. 8 wasted months during which I could have built multiple versions, tested frequently and improved my understanding of user needs to build a much better solution. This was all because I needed 8 months to save a sufficient amount for product development. 7 years and many startups later, regardless of whether I had the money back then, I now know how I could have differently approached product development to offer my solutions without code until I save enough money, nonetheless, it was a lesson I would never forget. The more important part is what I have come to learn next. For many, self-generated funds mean putting some money aside from an existing income stream. What I want to show you today, is how to raise money selling services; the approach I followed to fund my next startups. Let me begin with my story for clarity and then we will generalize for better understanding. It all started when many friends and acquaintances called for help. It turned out that my active involvement in the community to build awareness for my startup not only promoted the venture but also increased locals’ interest in the tech world. I would get calls and emails from strangers asking me for support and advice about building startups. The most common questions were about product development; who, how and when to hire? how to manage product development and evaluate progress? how to budget for development? etc. At first, I happily took the time to answer and lead entrepreneurs until what I thought was a passive involvement seemed to become more like a part time job especially when people ask if I can sit and do the tasks with them. I then realized I have an opportunity to generate funds selling consulting and product development services while building my startup. The next year, I generated over $100 thousand in revenue. If you are in college or sick and tired of your current job or need another stream of income to invest in your startup, SELL SERVICES. Luckily for me, my passion is in providing entrepreneurs with all the necessary resources to turn ideas into scalable startups. Selling consulting and product development services meant I would be doing just that while saving money to pursue scalable startup ventures. The best services you can sell are those that are aligned with your startup purpose. This allows for continuous learning while generating revenue. For instance, if you envision a global community of art lovers for exchanging ideas, buying and selling, sell the service by contacting buyers over email or phone and work on matching them with the right seller. If you envision a software that removes a lot of the friction out of writing books, offer to help book writers write or edit their work. If you envision building a social media tool for non-tech savvy small business owners, start by offering them the same service manually. Bookkeeping, content writing, resume writing, logo design, web/mobile development, tutoring, consulting, translation, data entry, data mining, online research, project management, sales, online marketing, event management, and countless other opportunities. You’ve found your interest, now, how do you find the client? Who are they? learn about their needs, problems, expectations, locations, likes and dislikes when it comes to the selected service. If you don’t know who you are going after, you won’t know where to find them or recognize who they are when they’re beside you ready to buy. Find and sell. Easier said than done but depending on your buyers, it is just a matter of hustle. Here are three channels for reaching and selling your services. There are several freelancing sites that can put you in front of the right buyer with a click of a button. Upwork is one of these sites although you can find many others that focus on a specific occupation such as design, marketing, video production, consulting and more. Create an account in few minutes then start applying. It is as easy as creating a Facebook account. Writing works much like a proof. Create a medium account at medium.com and start sharing lessons, tools, news and strategies that can be of value to your buyers. This channel is for proof and awareness. Even if they are not willing to buy or interested in buying at the present time, they are more likely to recommend or remember you when there is a need. Take some of your time to learn what they are interested in reading and learning about. The easiest way to learn about their interests is through interviews where you bluntly ask them the topics they are interested in exploring. You can also use services like Buzzsumo, type in a key word like social media services and refine your search to learn what people are searching and sharing the most. Or simply Google search to find what comes on top of the list, look at the comments of the found posts, see what people are asking, then you can either answer these questions in a post or write better than the top searched ones. Finally, spend quality time sharing and promoting your posts. Find social media groups and forums that are relevant to your service, answer questions found in relevant comment threads, and contact bloggers for a guest post. You don’t have to write but it is certainly a big plus and something that will differentiate you from the rest. Once you know who you’re going after, you don’t have to wait for them to come. Cold calling and/or emailing can start with those who took some of their time to read your posts, commented on them or even just left a like. You can find out who they are then message them privately or email and call them if you find their contact information. I decided to take it a step further, meet with them. I found that when I call for an appointment, I rarely get one but when I just show up, people are more willing to squeeze you in. I must have met with over 100 potential clients to end by signing 12. Keep in mind that people are more willing to listen if they’ve seen you once so introduce yourself by writing interesting content or as simple as commenting on their posts, messages, tweets and shares. Do all 3. Your chances increase significantly if you are active in online and offline communities and forums while posting and sharing content worth reading as you are applying to relevant freelance jobs or cold calling and emailing potential clients. Do this and expect your first project in as little as a week with some luck or as long as a month on average. You will certainly have enough savings to pursue your entrepreneurial venture within 3 months by investing no longer than 10-15 hours a week selling services. Be of value to your clients. There is no question that people will buy when the value they will receive from your services are 5X or more the investment they will make. Aim for 10X more and go above and beyond to WOW and surprise them with your work, commitment, communication and results. If you’re planning to do this only 5 times in your life, make them the best you could ever offer. For this to take place, focus on services you are skilled at. If you are just beginning your professional career and there isn’t much you are expert at, take some time to learn and enhance your knowledge. It doesn’t take long to be good at something if you commit to it. Keep in mind that your clients and all the contacts you will build in the meanwhile can turn into your first startup users/buyers once you start executing on your ideas. There is one disadvantage to selling services that can negatively affect your entrepreneurial journey. Sometimes we get so comfortable selling services especially if the income generated from such services is quickly increasing and turning into an interesting side project or even a full-time service, that we forget or delay startup execution. Paul Graham notes that this delay can be fatal, however, if you’re working on something so unusual that no one else is likely to think of it, you can take your time. The approach I took was designed to minimize risk. I started and grew my consulting services gradually until reaching my target financial goal. When I hit the target milestone, I reduced my commitment to consulting while increasing my efforts in startup development. Consulting services remained one of my main stream of income until I reached my target startup milestone where my energy is mostly going to my venture. But because I made sure I aligned my services with my startup vision, I was able to make the switch almost seamlessly since AspireIT, MVSOT and Upify are all built to provide entrepreneurs with all the necessary resources to build scalable startups. Don’t stick to your side service selling job. Invest the money you make on the side in a company that has the potential of making a bigger impact in the world. There is a bigger prize out there. Now, if you have a little bit of money laying around, that’s good news, because you only need a little bit of it to make major progress with your idea without selling side services. Join me on this journey and let’s do it together. How much money and what do I need the money for? The economic impact of the internet revolution is unprecedented. From new business opportunities to global trading, the internet has made it all possible. In the context of startup entrepreneurship, the rise and fall of newly introduced products and services over the last two decades ensured the survival of the fittest and the best. Luckily for the new generation of entrepreneurs, the best startup innovations are serving as a foundation for new venture initiations. For instance, if you wanted to create a website or mobile app 10 years ago, you either had to have enough knowledge and skills to do it yourself and even then, the resources required to build software were not in everyone’s reach, or spend countless hours looking for the right people for hire. Today, it takes a few hours to build a website or mobile app using app development platforms and without any prior tech knowledge. Few years ago, if you needed help but couldn’t afford a full-time employee, you are pretty much left with no options. Today, in few clicks, you can reach thousands of people around the world for freelance help. Few years ago, if you wanted to host your site, you needed what I would estimate to be 10X what it would cost you for hosting today. And the list continuous. The point is, it has never been cheaper to start and the initial investment required to initiate a startup is still declining. With all the advantages of startup cost decrease, it is becoming increasingly challenging to compete. The challenge is not only about fighting for the customer but also for investors’ money, innovation and growth. If you think there will be a better time to start a startup, you’re not exactly right. New innovations will make it cheaper to start but harder to be different. Depending on your product, background and founding team (number of co-founders and their background), this is a breakdown of your projected expenses from idea to scalability. Most of your projected expenses from idea to validation have a zero on them. free! Those are tools that are essential and yet free up to a certain milestone. Even legal services such as company registration which looks to be one of the costliest expenditures can be delayed until traction or validation; legal incorporation doesn’t make a company out of an idea. What will make a difference between investing $500 and $5000 is the human capital, also known as team. Although seeking outside help (e.g., freelancers) when needed will still be an option within a team of complementary skills, it is not essential to the development, design and frequent iterations to the core product starting with a prototype and all the way to scalable versions of the apps. For non-technical founders, a prototype or MVP can still be put together without code using app development platforms that make building apps a drag and drop job. I hope with this demonstration and explanation, I made it clear that money should not be an obstacle anymore. Many are those who gained valuable insights and even acquired their first customers with as little as $50 to nothing through non-scalable resources and free tools. Before we get into the How, let us first discuss Why and When would you want to bootstrap. The answer is obvious, isn’t it? No money, right? Is it really about the money? Assuming we are well funded and it’s time we turn our ideas into solutions worth paying for, what’s the next move? spend a ton of money hiring an engineering team? promote an idea? get an office space? where would the money go? the truth is, with no proof, the money has nowhere to go. Yes, you may test quicker, fail and iterate faster, and validate a model sooner with more cash but neither you or any investor would want to dump money just to test an idea. Why bootstrapping? so you can earn your way up to validation before scaling on strong foundations. By Earn, it is about taking the time to understand the market, existing solutions, customer needs and problems, gather feedback, implement, test, measure, learn more, build again and find the proof. Believe it or not, the difference in time from idea to validation for teams with a $5,000 investment and others with 10X this amount is zero to nothing for most software products. This is because the resources needed to prove a concept are the same in either case, that is, most of the time, there is not a $100 thousand software that needs to be purchased for code to be written or products to be marketed. Most coding software are open source while marketing is a matter of targeting and leveraging the different free platforms such as WordPress for blogging, forums and networking events for awareness, social media for promotion, etc. Have 20 years industry experience or working on a complex enterprise solution? that can be another story but one that is no different from any other startup ventures in terms of initial investment if the founding team is well equipped for the challenge. In other words, if you are non-technical founder looking to build a B2B Fintech startup by your own, expect a hell of a ride. Technical founders perform 230% better than their non-technical peers for enterprise startups, according to the venture capital firm First Round Capital. Pick your battles. To answer the When in bootstrapping, expect no one to pay you to run experiments so always be bootstrapping from idea to traction, sales or even finding product-market fit. After all, who wants to give away cheap equity for an idea that few weeks later can build some value and turn out to be worth more than its original 10, 20 or even $50 thousand valuation? With tangible, proven progress under your belt, expect to make a choice: get funded for growth or reinvest the gain for probably slower but steady growth. Before you settle for bootstrapping, although it should be how every entrepreneur starts, it is equally important to learn about and consider funding. Bootstrapping means retaining 100% of the company. This gives entrepreneurs the freedom to control their own destiny; mission, vision, growth rate, strategy, product, team, etc. Is this always the best for the company? we can clearly see how convenient it is for entrepreneurs but what about the company? Investors are looking for 10X (or higher) their investment and for this to happen, they have to push. Usually they are more experienced and better equipped to make business decisions that will maximize the value of the company even if it comes at a cost of losing the CEO or the founding team in management. Bootstrapping keeps you scrappy which teaches you how to be efficient and resourceful. This also means that you can easily be undercapitalized. Although some investments such as office space, fancy computers, marketing and premium tools and services to operate the startup can be compromised, key assets that constitute the foundation of any business such as team, cannot. Hiring bad talent = startup failure. A bad talent is not necessarily inexperienced but one that doesn’t culturally fit, doesn’t believe in the vision or share the passion. If money is so tight that you cannot afford to hire strong assets (team) for product development or growth, seek funding or sell services for self-funding. Bootstrapping your way up to competitiveness when others are well funded can set your apart from the crowd. This differentiation comes with challenges too. Startup X backed by VC or Angel Y has a lot more meaning to it than just the dollar amount invested. Backed startups tend to gain credibility and trust, and convey safety and commitment when it comes to signing big deals or securing future funding. Investment can be a strong sign of assurance even for key talents sorting between the different opportunities and considering a young startup as one of the options. Bootstrapping means control and ownership. The question becomes, is full control and ownership (100%) the best decision for the company? In other words, do I want to own 100% of a $200,000 company or 80% of a million dollar one? Though funding doesn’t guarantee this spread in valuation, it certainly enables faster growth and market penetration. Bootstrapped startups risk on leaving money on the table, that is, in our example, build a $200,000 company when they can build a million dollar one in the same period of time. Bootstrapping signals responsibility, money management and commitment. Funding in the other hand, signals uniqueness, potential and entrepreneurs’ real intentions in building a business that can make a major impact in the world. This is given the effort it takes to obtain funding and prove the uniqueness and potential of the value proposition. because less than 1% of startups receive VC funding, being among the 1% makes funded startups different. Furthermore, because revenue is not the only startup valuation variable, funding puts a number on the worth of the startup which can make future funding and potential acquisitions relatively easier, even at pre-revenue stages. Given investors’ main objective is to exit at the highest possible valuation, one of their responsibilities is to maximize value and facilitate acquisitions. Bootstrapped startups can forgo these benefits. Bootstrapping is about self-reliance. The truth is, for some models, even with a team of complementary skills and self-funding, bootstrapping is not a viable option. Take the example of Quora. The company raised over $140 million before generating the first dollar. Also, take the example of hardware startups that require labs, manufacturing equipment, key hires and other resources just to reach a level of product demand (validation) that often qualifies startups for an investment. Pick your battles. Bootstrapped teams reinvest gains for growth. Reinvestment of gains can inhibit growth especially if revenue is not growing fast enough to meet required capital and it usually won’t which is the main point of funding. Bootstrapped teams are left with the move slowly, grow steady option. Basecamp and Qualtrics founders are big proponents of the slow and sustainable growth attitude. Exponential growth is not the only growth strategy. Bootstrapped startups have to compete with funded rivals. When it comes to fighting for key contracts, deals, partnerships, and gain trust, bootstrapping can come at a disadvantage in the eye of counterparties that value quality, punctuality and long term relationships more than transaction amounts. It can be an unfair battle. Bootstrapped startups can compete with funded rivals by picking a viable and value-adding strategy, overestimating required resources, focusing on value, personalizing customer experience, and leveraging rivals’ growth. Regardless of which route you decide to take later on in the journey, the initial steps are always the same: maximizing human capital first and using existing and/or self-generated funds second, to build startup value. This section is about how to build startup value without external funding; bootstrapping. We often get stuck thinking about money for hiring, product development, marketing, growth and other investments that we ignore the very first and basic reason behind our startup; solving problems and addressing needs. You must have heard this a thousand times, but the first step in startup development especially in bootstrapping a startup, is to maximize customer understanding through one on one interviews. Let me explain why it is even more important for bootstrappers to learn as much as possible about their potential buyers. You’re going to have to focus on cash flow. Only when you know what potential buyers are willing to pay for today, will you be able to decide your next move. You’re going to project expenses and possibly sell services to fund your startup. No one wants to spend months planning, working extra hours and building products without some tangible proof that customers are eagerly expecting a product. Interview as many as 100 plus. The interviews are meant for more than customer understanding and problem/need definition. Interviewees will help you fund your startup. This is how. 1- Build a relationship with your interviewees. This will take some time but when you show care for their challenges and commitment to build solutions, they are likely to want to hear from you more than once. 2- With a qualitatively validated problem-solution fit (use 50% or more deliberately asking for a solution as a qualitative validation criterion), articulate the problem and solution then email it to your interviewees. End the email with pre-order offers and shipping (or launch) dates. I usually like to add some designs to help buyers envision their experience using the product. This is your first quantitative validation test. Up until now, you have not invested a dollar. If you want to add designs to visually present the product, you can use free design platforms like Invision or others. For hardware products, crowdfunding is the best pre-selling channel. Although, sites like Indiegogo and Kickstarter expose you to millions of buyers with a click of button, you don’t have to necessarily use any of these sites. You can pre-sell via your own website using TryCelery.com. Simply invite your interviewees to the site and, as usual, help them picture the product using designs and a video that can be as simple as recording yourself using a prototype. What comes first, pre-selling or projecting expenses? if you spend time projecting expenses, you may be wasting time planning for something no one will pay for, and yet, if you presell first without an idea about your projected expenses, you may dig yourself a hole if the product turns out to be demanded, so what’s the best move? 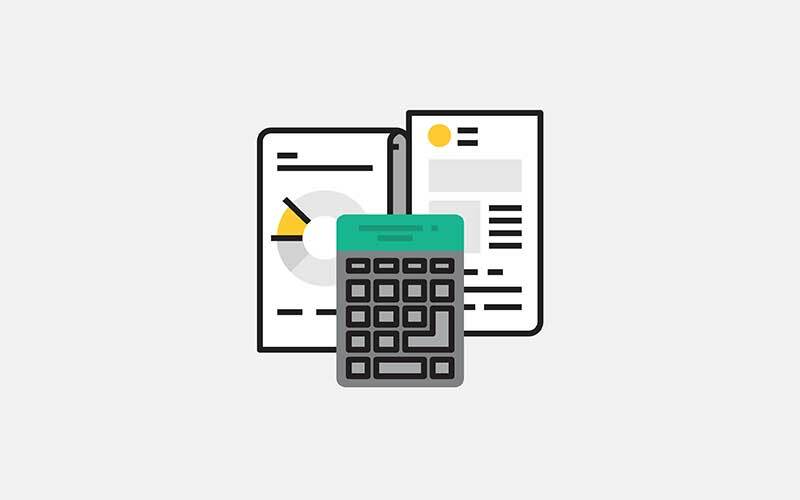 During the interviews stage, have a general idea about your projected expenses in the first 3-6 months (always overestimate) while being more specific as things (demand, features, timeline) get clearer before or during the pre-orders stage. If you don’t have the resources to offer the product within a week or two, don’t promise it will be ready by then. In the meanwhile, you can use non-scalable resources and methods to offer the product or service. No matter how complex your solution is, you can find a way to combine existing and sometimes completely unrelated tools to simulate the product logic and purpose. For instance, a simulation of an Uber concept can be as simple as a social media page with a phone number for riders to call. One of the team members picks up the phone, locate the rider, uses Find My Friend app to locate the driver, dispatch ride request and confirm ride. This is non-scalable and has a lot of limitation but can save founders a lot of time in development until validation (a lot of people call), generate revenue and possibly use it as a story to tell investors and future app users. In Step By Step Guide To Validating That Your Interviewees (potential buyers/users) Are Telling The Truth, I discuss product simulation using non-scalable resources in a lot more details. Find the section below. Products that look and feel real on the surface but are being “faked” on the backend are commonly referred to as hollow MVPs. The idea is that, if I can make users/buyers believe that core product features (most important features) are functional, they are more likely to use/buy it and, as a founder (team), I am more likely to understand how they use it and how the code/algorithm should look like when product development begins. A few examples will make the approach clearer. Instead of building a coupon marketplace site and app, Groupon founders started with a WordPress blog and by manually sending PDFs with vouchers that they also created manually. Notice here the user/customer is under the impression that the algorithm is taking care of the logistics when it is the team who was handling it manually. This process by the way did not last long until they built their advanced web and mobile apps that helped them reach the second fastest company to ever reach a billion-dollar valuation in the world. ZeroCater connects companies with restaurants that would cater. The approach they took was very similar to that of Groupon. A website for accepting orders while the core “matching” feature was managed manually through PDFs and phone calls. Doordash is a food delivery service. The team took the same approach by receiving orders through their quickly built landing page and assigning orders to nearby drivers, starting with their friends, through phone calls and Find My Friend App. Zappos, the e-commerce shoe and clothing shop, did not have a product at all when founders announced their company and purchased shoes as needed from local shoe retailers instead of stocking their inventory. What about services where a complex backed is required? In this case, use one of the four approaches below. The following approaches can still be used in products that don’t require complex offerings. 1) Get Manual. Yes, you can still get manual no matter how complex your logic is. Netflix started with a landing page announcing their service and for accepting movie requests and payments. They handled every movie request manually until the demand exceeded their capacity. Another example includes a peer to peer money exchange platform for which the founding team processed all payment requests manually, including tracking payment and sending notifications for updates and confirmations. 2) Sell A Physical Version Of The Digital Product. For database, analytics, accounting and virtually anything that requires reporting, use the same logic as above. Allow users to input their information, request their email/payment information, prepare the report manually and email it to the personally. For example, Taylor Davidson from Foresight created a financial model for startups and investors. His approach to introducing the product was as little as a video of him using the excel model which he uploaded to YouTube then to a landing page he created. As number of downloads increased exponentially ever since he posted the models, Taylor started charging users for downloads and help in its customization which he does manually up until today, 17,600 downloads later. 3) Repurpose Existing Platforms. To simulate the service, you can rely on platforms that offer similar features to yours which may be solving other problems but can also be used for other purposes. Take the example of Facebook. Some of its features include sharing, messaging, profiling, listing, gaming, and grouping. If your solution includes one or a few of these features, think how you can leverage Facebook’s free platform to simulate your solution while doing as much manual work as you can. For instance, for ride sharing applications like Uber, you can use as simple as a social media page with a phone number for riders to call. One of the team members picks up the phone, learns about the location of the rider, uses Find My Friend app to locate the other team members or contractors, calls the closest person, and confirms with riders. 4) Use App Development Platforms. One of such platforms is Bubble.is. In no longer than a few hours, you can create a functional web or mobile app with features that may take you days and thousands of dollars to create. Many applications operated under such app development platforms until stages well beyond the initial testing phase. After evaluating, selecting and internally testing the chosen non-scalable method, let it be your fastest path to market for quantitative testing and further validation. A founding team with complementary skills can go as far as building a quick solution in 1-2 weeks. Notice, so far, you may have still not spent a single dime except on a domain name if needed. There is so much to do and many tools to use that one can make significant progress and even generate revenue without spending a dollar. Just like funding, hiring isn’t a matter of picking up the phone or posting a job proposal; it takes time to find the right fit. Another advantage of starting within a team of complementary skills is that hiring can be delayed until some higher level of validation is reached. Even for such teams, hiring begins the day the startup venture is initiated; execution (customer interaction). I hired the smartest and the most experienced. I also hired the hungry and least experienced. I choose and highly recommend that you choose the second every single time especially under a limited budget. The most experienced is not accustomed to a bootstrapping lifestyle especially if they are way beyond this stage in their career after having built or was involved in the build of a growth startup and experienced the luxury of working for a big corporation. You’d think their experience is invaluable, and it is, but for later supervision and leadership, and usually not to get hands dirty for a nickel or even majority ownership. Just like co-founders, the best early stage employees/contractors are those you have a previous contact or relationship with. Although not everyone has the privilege of being surrounded by potential team members that they can reach out to and follow up with, it is important that founders take the time to get to know qualified candidates for the job. It is as simple as starting skill hunting 2-4 weeks ahead of this stage rather than the night the member is needed. In the meantime, founders can work with the best candidates on smaller tasks, test projects, meet for coffee or help each other (exchange services) for free. It isn’t as sequential as “building the core product” as soon as the team quantitively test user behavior and validate their needs and expectations using non-scalable resources and methods since multiple iterations and events can take place expectedly or unexpectedly that ca change the course and direction of the startup, but the next step to non-scalability is certainly building for scalability. This entails focusing on what users/buyers consider the core of the solution. In other words, what they really use the product for. Once again, with a team of complementary skills, the product and its potential iterations can be built internally without referring to freelancers or part/full-time employees. For non-technical founders, freelancers can provide great help. Beware that a team with 100% freelancers is often not scalable. Building a growth startup is more than just a perfect bug free software and a marketing budget. Several iterations, inevitable system breakdowns, user complaints and other events and factors require permanent attention which not only rarely takes place with freelancers given their other responsibilities but also hard to manage distance and time difference. Freelancers can help but should not be the only help for long. Finding the right co-founder match is inevitable. And this takes time. Just like hiring, the best co-founding relationships are made not built. By now, most third party systems and tools such as hosting, email and analytics should still be free unless an upgrade is needed. It may be time to create a legal entity and any partnership agreements needed between the founders. This costs between $300 and $600 sometimes more depending on the type of business entity. Non-technical founders should still be operating under the $5,000 benchmark that CB Insights found to cost founders to start startups nowadays. For this group of founders, investment will mostly go to product development and iterations. Let’s take a moment here to discuss a bootstrapping strategy that will allow you to overcome initial investment costs on product development almost completely by creating win-win partnerships with key parties. Assume that after you’ve taken the time to test potential product users’ interest to use and pay for the product, you’ve learned a lot about their needs and was able to iterate on the product until a percentage of people you spoke with pre-paid for it. Assume also that the investment needed to hire a team or person to help you build the product is $5,000. But you still don’t have this amount and you feel that exchanging equity for product development is a bad idea (smart). What you need to do is create a win partnership with a potential for the team or person who will be performing the service to get a lot more than what they asked in exchange for their services. “Over the past 4 months, we took several steps to validate the idea. We started with hypothesis X and over time, through multiple interviews, we learned Y. In fact, we have Z number of subscribers to our mail list and believe it or not, W percentage of them pre-paid for our upcoming product. If we work together, we won’t pay you $5,000, we’ll pay you $10,000 conditioned on the product satisfying user needs. What we’ll do is, for every dollar we make, 70% will be added to your payment until you get fully paid. And after that, we’ll make new estimations for further product development work. Also, I will make sure I refer you to X number of people such as Y and Z. 4) Proposing a win-win partnership that can lead to great results despite your limited funds. This bootstrapping approach also works very well if you’re building a hardware product to negotiate with your suppliers, manufactures, distributiors and other key stakeholders. It also works if you’re hiring marketers, business developers and essentially anyone with whom you can build a win-win. Here is another example. Download the story of how I negotiated product development costs for Upify. And always remember that there’s someone out there who can benefit from your partnership and will be willing to delay compensation for bigger outcomes in the future. Are customers buying or signing up as fast as you can build or add more capacity (servers)? Is revenue growing exponentially and customer acquisition cost decreasing considerably? If you are approaching or have reached this stage, you are ready to scale. With scaling comes new responsibilities. For software startups, scaling usually means hiring. By combining option pools with reinvestments and a slower growth, a startup can continue to operate without outside capital while hiring the best in the market. Jason Fried, founder of Basecamp, is a proponent of the grow slow approach. Basecamp merged out of a design agency that Jason started in the 90s to become one of the leading project management platforms in the world. Steady, sustainable growth is what Jason endorses. Smart debt can be of value at this stage. Borrowed funds to meet user demand, purchase equipment, expand and make other investments can be cheaper than selling equity even under high rates. Interns at this stage and even earlier, can have a tangible impact on your startup. When interests are aligned and with a fair compensation, as little as free meals and potential job consideration if certain milestones are met, a team of ambitious interns can push harder than you think despite lack of experience and expertise in the field. For marketing, design, programming and even project management or assistance, interns can increase efficiency and productivity while building and preparing them to take on bigger responsibilities in the company. Angle/Venture Capital investment is more than just money. 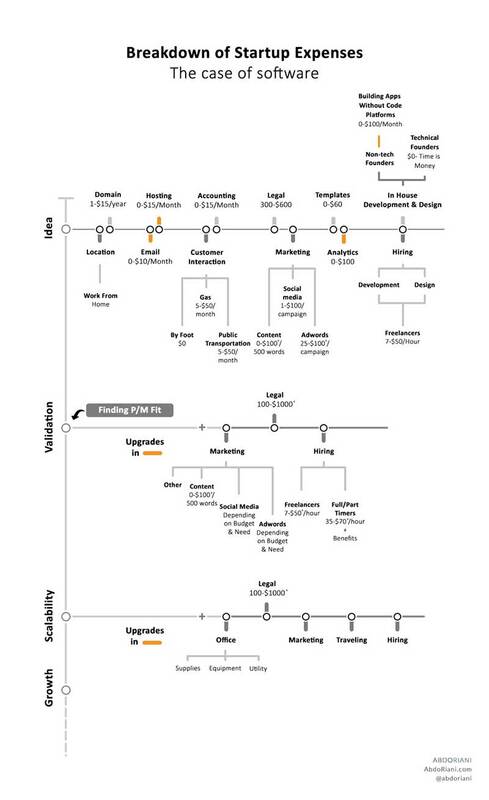 Connections, hiring, advisement, leadership, acquisitions, valuation along with faster growth, on average, and other benefits come from investors’ funds. Just like hiring and building long term successful co-founding relationships, finding the right investors is not a matter of picking up the phone, cold calling or even meetings for coffee to discuss funding terms and valuations. It’s a long-term investment that every entrepreneur has to make early on in the venture. Mark Suster, entrepreneur turned VC, notes that by constantly taking focused VC meetings, you will have relationships established for when you are ready to raise. He suggests dictating 5% of your weekly time to fund raising. There it was. I hope I was able to better convey the fact that startup funding for venture initiation all the way to validation and product-market fit, should be the least of your worries. If it still is, sell services. Better yet, sell services that solve the problem you plan to solve with your startup later on. Do it manually or using non-scalable resources. Always keep in mind that the best-case scenario is when your customers fund your startup. Offer discounts and free services for pre-orders. You’d be surprised what people are willing to do to solve a big problem or address a painful need. 1- Ask, how you can or could have minimized expenses, speed up time to market, generate sales from pre-orders, raise money by selling services and bootstrapped your way up to validation with your startup idea. 2- Email me your approach and I’d be happy to assist you. This iframe contains the logic required to handle Ajax powered Gravity Forms. We do not use your email for spam. With this download, you’ll also get our latest on startups and online businesses. Usefull Information.. Thank you for sharing this article.. Excellent breakdown. Getting outside funding is a double edge sword. I belive if a startup founder can self-fund do so, however, scalability will be hard but with the right model and drive it has been and can be done.